… with social media people take pictures of what they’ve done or what they’ve seen. It’s much more instantaneous. Probably a feature, not a business. Facebook is in the midst of a small program with a handful of cafes in the San Francisco and Silicon Valley areas. In the program, first noticed by Inside Facebook, Facebook provides its partner cafes with free routers, and customers check in to the business on Facebook in order to access the Internet. The service is being tested inside Philz Coffee in San Francisco, according to Hunter Walk, as well as a handful of Palo Alto cafes. The merger math says GetGlue’s TV check-in users are worth about $70 each. When you’re ready to take it to the next level — visual contact. 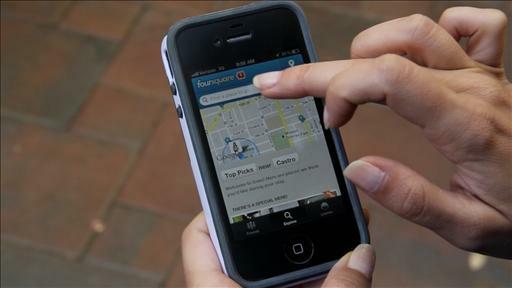 Foursquare doesn’t want to be another popular — but unprofitable — social network. Its new plan to make money? Personalized coupons. Foursquare launched a new online verification service on Tuesday, allowing businesses to sign up for the company’s partner toolkit — which includes real-time analytics and loyalty program options — faster than previously possible. For a one-time $10 fee, partners can verify that they are indeed a legitimate local business that potential customers can find on Foursquare and visit in meatspace. Before Tuesday’s launch, businesses were forced to verify themselves the old-school way — via snail mail. So What Exactly Can Location Aggregators Do With Our Foursquare Data? Foursquare says Banjo and Sonar can aggregate users’ location data, but Girls Around Me couldn’t. What’s the difference? Breaking up is hard to do, especially at start-ups. You’ve Heard of "Checking In." Now there’s the "Check Out."